Published on 02. 06. 2012 in comics and cartooning and hype & linkage. Closed Tags: Joost Swarte, OCX, Oslo Comics Expo. 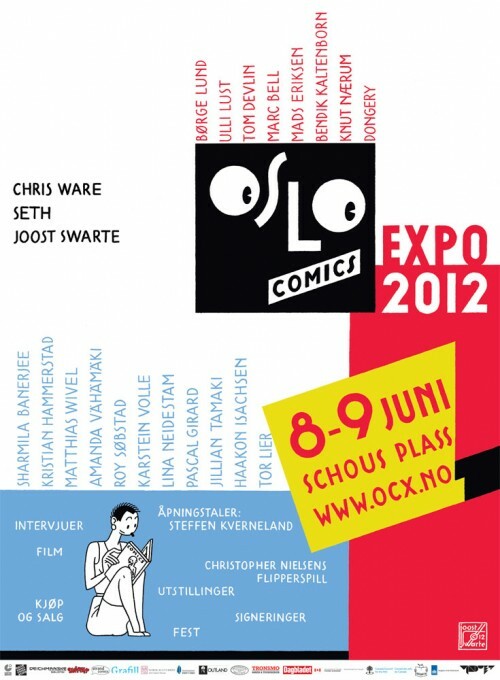 Next weekend I’ll be visiting Oslo to attend its Comics Expo (OCX) for the third time. I can’t wait — they seem really to have upped the ante this year, with an ambitious program and an impressive roster of guests that includes such luminaries as Joost Swarte (who did the festival poster, above), Chris Ware, and Seth. I will be participating in two day-long seminars: one held on the Thursday run-up to the festival proper on the aesthetics of modern comics, where I will be debating my long-time internet interlocutor on comics Domingos Isabelinho live for the first time; and one — held on the Friday — on cultural lobbying for comics, focusing on the establishment in Norway of a national center for comics. In addition to this, I will be presenting the Nordic comics anthology that I edited, Kolor Klimax (recently published by Fantagraphics) in the swell company of two of its fine contributors, Bendik Kaltenborn and Amanda Vähämäki. And to cap things off, I will be interviewing the festival’s headlining guest Joost Swarte on stage. Really psyched about that!